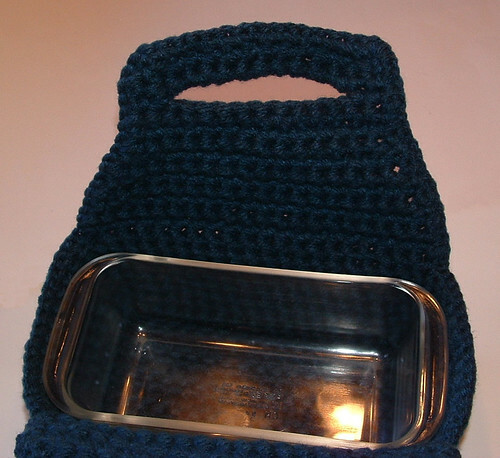 I thought I’d share my loaf pan carrier that I crocheted. I used the Crochet N More loaf tote pattern and did a few changes to fit my large loaf pan. A few people had commented on this pattern that it ran a bit small so I did a few modifications to make sure my loaf pan fit comfortably into the carrier tote. I crocheted my loaf pan tote using two strands of Red Heart chunky yarn. The project used just under two skeins of RH Super Saver chunky yarn. I used two strands of Windsor colored yarn held together with a N (9 mm) crochet hook to work the pattern. I crocheted rows 2-12 of the pattern for a size of 5-3/4″ wide by 10-1/2″ long after row 12. After row 12 which is a repeat of row 6, I moved to row 14 and followed the patten thru row 16. I used an H (5 mm) hook to work a single crochet (Sc) row around the top edge rather than doing the reverse Sc edging that the pattern called for. I did my edging row using just one strand of chunky yarn. I did have to work 2 Sc in a few stitches around to make the edging lay down flat. 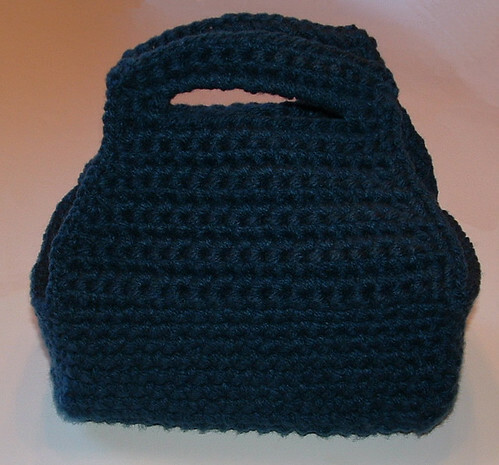 My finished measurement for the loaf pan carrier tote is 9-1/2 inches long by 5-1/2 inches wide. The tote is 4 inches tall at the side and 10 inches tall to the top from the bottom base. A full sized glass loaf pan fits nicely into the carrier tote as shown.